Next Step: Gingerbread House Decorating Contest - The Results Are In! Gingerbread House Decorating Contest - The Results Are In! 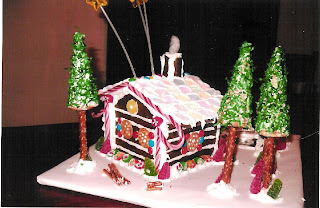 The votes have been counted and I am pleased to announce the winner of the 2009 Gingerbread House Decorating Contest! It’s a Marshmallow World received 50% of the 22 votes while Little Cabin in the Woods received 32% and the architecturally-sound Carpenter Gothic had 18%. Carpenter Gothic, as some of you may have guessed, was the handiwork of my architect boyfriend Bob. Last year I bought him the book “The Gingerbread Architect.” It contains blueprints for some extremely intricate houses and Bob really outdid himself with a 15” by 15” submission! He also made fondant which is a feat in itself. 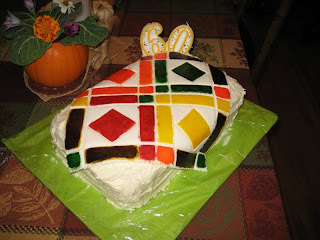 My mom made this quilt cake for my Aunt’s 60th birthday a couple years ago and swore off ever working with the stuff again. Bob experimented with fondant a year ago, inspired by Ace of Cakes (I got pretty excited at the prospect of dating a cake maker extraordinaire), so he sort of knew what he was getting into. Rolled fondant is hardened by the addition of gelatin and when applied to cakes and desserts give the shiny, polished look. You see it on a lot of wedding cakes and it runs pretty expensive commercially. Little Cabin in the Woods was submitted by my mother, Billie! She created gingerbread houses when I was younger so I knew she would enter something pretty adorable. Actually, the contest was her idea after she saw pictures of the one my friend Kari and I did last year. I got to enjoy this one in person when I was home for Christmas. In her submission she told me that she had to make two batches of gingerbread because her dog got ahold of the first one when she left it unattended on the counter! That leads me to It’s a Marshmallow World, the labor of love from Kari and me! You may think it is strange that I participated in my own contest, but this was the reason I made sure to provide the same type of descriptions and number of photos for each entry and left the judging to the blog readers. I did not want to be left out of the fun! I learned a trick for rolling dough from Kari – lay a sheet of wax paper over the dough and roll over that so that it does not stick to the rolling pin. Even the most floured dough seems to leave little bits on my pin so I thought this was a great tip. One area we experimented with and are looking forward to trying again is frosted windows. We crushed blue jolly ranchers - using a Magic Bullet! – and filled a cut out window hole with the bits. When the gingerbread bakes, the candy melts into place. Do not overload the space as it can leak onto the gingerbread and stain. Another godsend were the Candy Melts we found at Michael’s. These discs come in a variety of colors and can be melted and re-melted in the microwave. It hardens extraordinarily fast and was more reliable than the royal icing we made out of powdered sugar. I set one of the roof parts on ans able to let it go after only a few seconds. On the other hand, it hardens extraordinarily fast so you have to work quickly – having four hands came in handy! Thank you to all of the voters and Kari, Bob and Billie for submitting! Ready for next year? If you have a small crockpot...you can use that to keep the candy melts warm and ready to go, so you don't have to keep reheating them! I learned this my first year of making candy coated pretzel sticks for presents with my first grade class! that is a great idea, thanks Beth! That is a great idea, we will have to note that for next year.